What’s the BEEF with MEAT? In today’s society meat has become taboo, a “no-no” word in certain circles. Phrases such as “slaughtering feedlot steers”, have been forbidden and replaced with words such as “harvesting protein”. Our reasons behind our fears, misconceptions, and some times ignorance each have their own stories, but as Agvocates I believe we need to try our best to learn ourselves and in turn to teach others. Now all jokes aside, you may be asking yourself where this “agvocate’s” beef with meat happens to lie and truthfully that’s what I my self have been questioning latley. I for instance, once went a year without meat because of a “challenge” I had signed up for; I also was so convinced that it was practically a sin for my family to eat Jim (my favorite steer) that my younger cousins wouldn’t eat beef for about a month; then there was my fiasco with Moo and Quack my two hogs (don’t ask) and needless to say I’m still a little iffy on the pigs residing out back. Needless to say I’ve had my fair share of adventures regardless with meat and I’m often the black sheep of the family, however I’m working on that too. Since I’ve moved to Kansas my roommates have informed me that Mac n’ Cheese is not dinner unless it’s beside a meat, that I am NOT allowed to feed them chicken every night, and that eating meat and more than one variety more than once a day will not harm me in any way (; I’ve also managed to eat my first ever T-Bone steak raised on the Gleason homestead, been fed pork from more places in the country than I have yet to venture, and been offered lamb that I have yet to try (; But hey, I’m getting there, my teammates have gotten through to me more in the few months that I’ve been here, than in the 19 years my family has been trying to. I’m even taking a Meat Science class this semester where I hope to learn more and broaden my horizons just a touch. I do know the healthy benefits we recieve from the intake of meat protein and I often recite them to others; the added iron, vitamins, protein, and essential amino acids are just the tip of the ice berg. We often get so caught in what we hear in the news or read on Facebook that we forget to find out for ourselves. And in my case we let silly habits, illconcerns, and stuborness overtake us. I honestly belive in current production agricultural practices based on what I know, what I’ve seen, and what I myself have done; however I believe it is up to each of us to make that educated decision for ourselves. 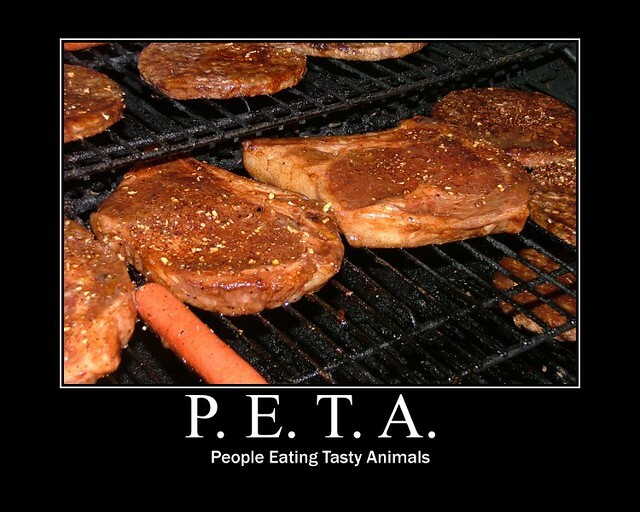 So,what’s your BEEF with MEAT?